The second in a two-part series. Read the first story here. By 2015, as Donald Trump was launching his political ambitions with a promise to revive the U.S. coal industry, multiple co-ops were building larger solar arrays and finding innovative ways to get communities to plug into them. This year, the solar footprint of U.S. co-ops will have grown 10 times as large in four years, a journey NRECA describes in a recent report titled: "The Solar Revolution in Rural America." It began as a tough slog. Polls showed that co-op members viewed solar as exotic, difficult to manage and, above all, too expensive on a communitywide scale. As one member of a co-op focus group insisted: "Signing up can't result in a net loss to my wallet." The coal dependency started during the Great Depression and was reinforced in the 1980s when the co-ops built a system using co-op wholesalers. These are centrally located coal-fired power plants with long-distance transmission lines that spread electricity over 56 percent of the nation's land mass. The system is financed, in part, by very long-term power contracts that limit local co-op power production to 5 percent or less. The dispute had some nasty moments and involved $150 million worth of damage claims by the co-op power supplier, which accepted $37 million in a legal settlement. Jim Spiers, a newly arrived vice president at NRECA in charge of business and technology strategies, had been an executive at Tri-State and was involved in the early stages of the Taos matter, which he recalled as "part of a family discussion." But imposing limits on local renewable energy has recently triggered discussions outside the co-op "family." Last month, Colorado's Public Utilities Commission said it would look into a complaint by another local co-op, the Delta-Montrose Electric Association of western Colorado. It asserts that Tri-State's limit on local solar energy is unfair. "These issues all come down to how our members relate to one another and share costs within the association," explained Lee Boughey, a spokesman for Tri-State. He said the contract was a private matter between Tri-State and its 43 local co-ops. Meanwhile, Virginia's General Assembly has waded into the issue by raising a cap imposed on local co-ops, going from 1 percent on local solar energy to 7 percent. Another co-op "family discussion" has been to find paths to more renewable energy at all levels. Under Spiers, NRECA's 2014 study of solar power morphed from an exploration into a "big education project," he said. It was aimed at what might be needed if the price of solar-powered electricity came down. NRECA began working with a small group of local and wholesale co-ops. It published training manuals like "The Communicator's Toolkit," which suggested ways to minimize the risk of using solar while capturing its benefits. That was timely because in 2015 the price of solar energy began to crash. "We happened to be in the right place at the right time to pull together our co-ops," Spiers explained in an interview. Some members lived in apartments without solar. Co-ops developed "virtual net metering," which meant customers could still buy access to a solar project and get credit on their utility bill without connecting to the array. Finding cleaner, closer power sources has helped trim NRECA's traditional reliance on coal from 54 percent in 2014 to 40 percent in 2017. The buyers wanted local control and ownership of the island's power system. At the time, over 90 percent of its electricity was generated by diesel fuel imported from the continental U.S. That tied electricity bills to the global price of oil, gyrations that gave the island the most expensive electricity in the United States. Hawaii enjoys legendary amounts of sunshine, but the cost of turning it into electricity by 2008 still seemed prohibitive. Nonetheless, the co-op's board of directors rolled out its strategic plan. It was to reach 50 percent renewable energy by 2023. "That was a stretch. Nobody knew how we are going to get there at the time," explained Beth Tokioka, communications manager for the co-op. 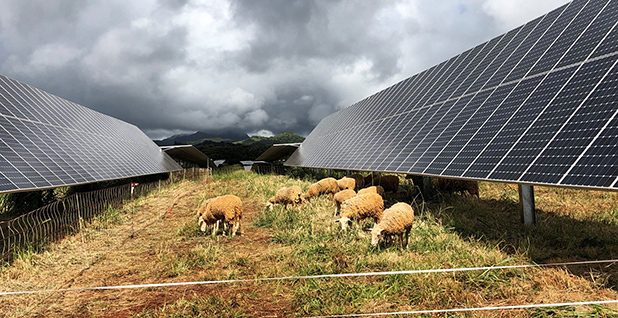 As the price for solar kept dropping, the Kauai co-op began bidding on solar storage batteries, which were expensive but not nearly as expensive as power made from imported diesel. Tokioka said Kauai operates the world's first solar storage system applied to a community power grid. Banking on its homemade renewable energy, the co-op is beginning to flourish, going from an almost 100 percent debt to a 30 percent equity position. The state of Hawaii has recently set a goal of developing 100 percent renewable energy by 2045. Kauai will now hit 90 percent in four to five years and reach 100 percent over a 24-hour cycle "well before 2045," predicted Tokioka. "But who knows how technology is going to evolve in the meantime?" she added.